There are tons of unique places for photos in Pandora. Pandora is the newest land to be added to Animal Kingdom. It is filled to the brim with landscaping and unique features that are all great places for photos at Animal Kingdom. 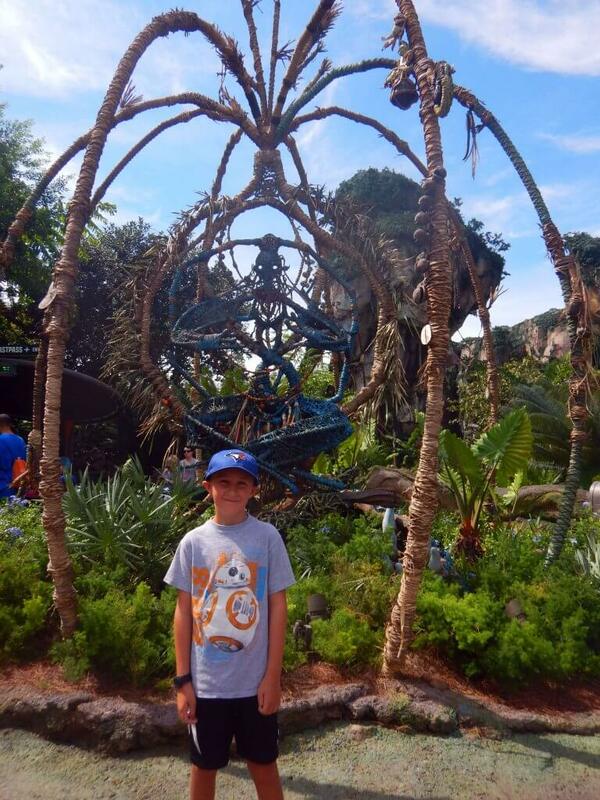 From the interesting sculptures, like the one above, to out-of-this-world plants, you will have a field day taking photos in Pandora! The Animal Kingdom sign on the path to the bus stop. 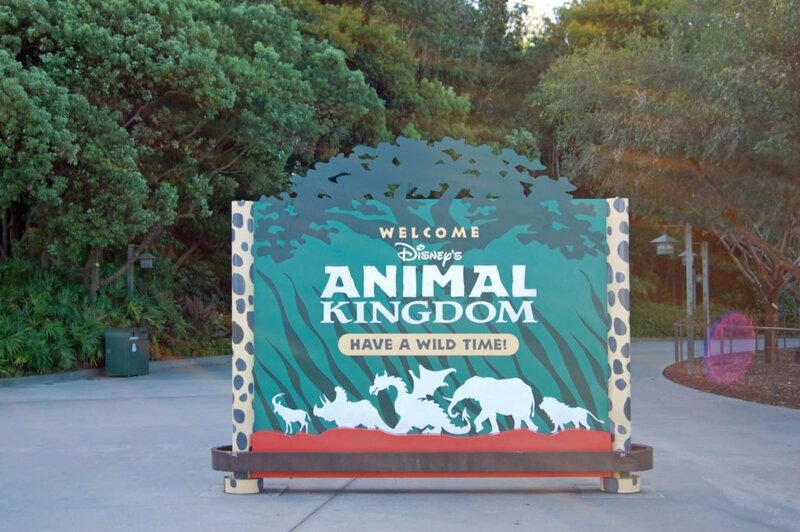 On the path from the bus stops to the entrance of the park, you will see an Animal Kingdom sign. This is another great spot for family photos. As you walk towards the turnstiles, you will see many people stopping for this picture. For a fun twist, take a picture of your family with this sign at the beginning of the day on your way into the park, and then take another picture with the sign at the end of your day. It will give you a unique “time-lapse” perspective! 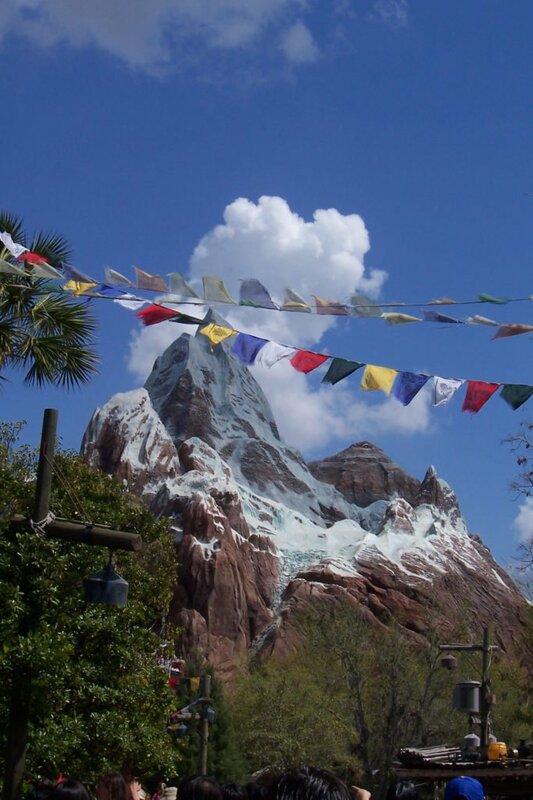 Another popular location for photos in Animal Kingdom is Expedition Everest. There are two primary places to get some great shots with the mountain in the background. The first is on the bridge between the Theater in the Wild and Asia. The second is in a spot just to the right of the path between Africa and Asia just as you enter Asia. This is the place where you will see the small altar. If you stand in just the right spot, the top of the altar will line up exactly with the peaks on the mountain. Many times, you will find a Photopass photographer in one or both of these places. In Dinoland USA, you will find several dinosaurs. Some are very cartoony, while others are more realistic. You will even find a few dinosaur skeletons in the area. Any of these would make for cute photos of your family, depending on the look you want. Even the entrance to Dinoland USA from Discovery Island is a great spot for photos. 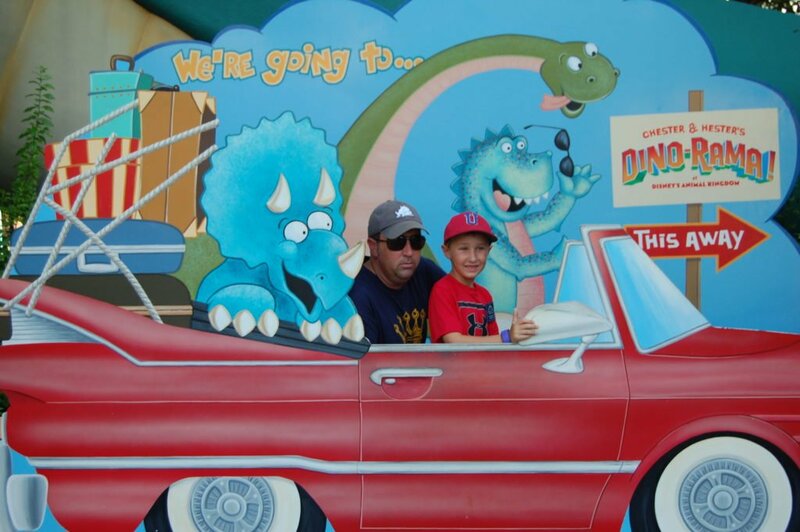 In Hester and Chester’s Dino-Rama, you will find a cutout photo booth with a car and dinosaurs in it. I love taking pictures of my son pretending to drive the car full of dinosaurs! In Asia, there are prayer flags stretched across the pathways. There are several places where you can get some good photos with the prayer flags in the background. This is an example of taking pictures without the background screaming Disney World. 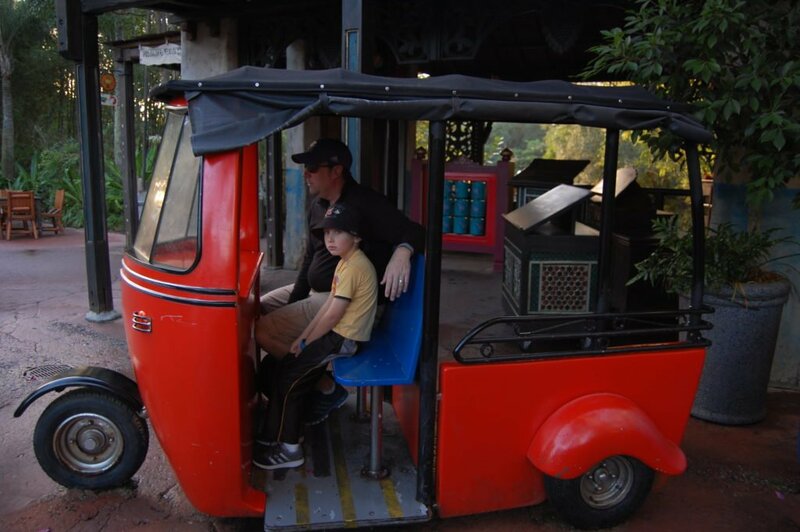 Also in Asia, you will find a couple of rickshaws sitting about. These rickshaws are some of my favorite places to take pictures. Your kids can sit on the rickshaws for some really cute photos. The view of the Port of Harambe from the bridge to Africa. 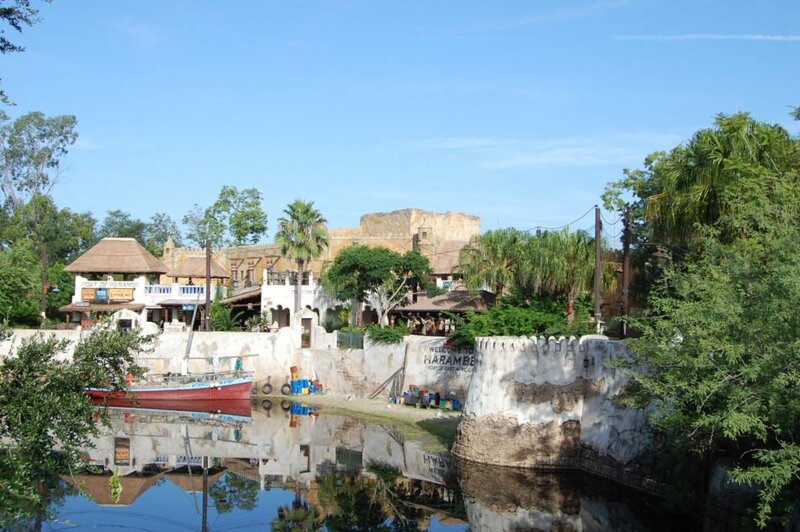 If you stop on the bridge from Discovery Island to Africa and look on the left side of the bridge, you will see the Port of Harambe with some boats and things. This spot on the bridge is another great spot to take photos. 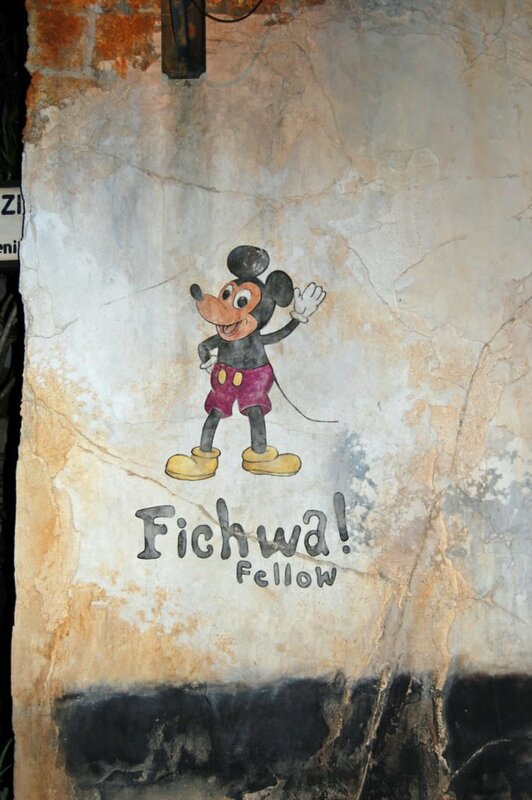 No one will ever know from looking at these photos that you were at Disney World! 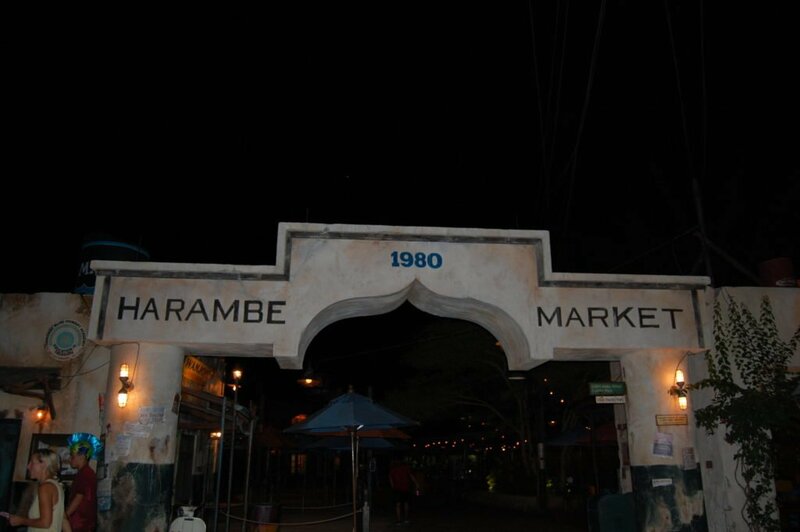 The entrance to Harambe Market is one of many places for photos in Harambe. 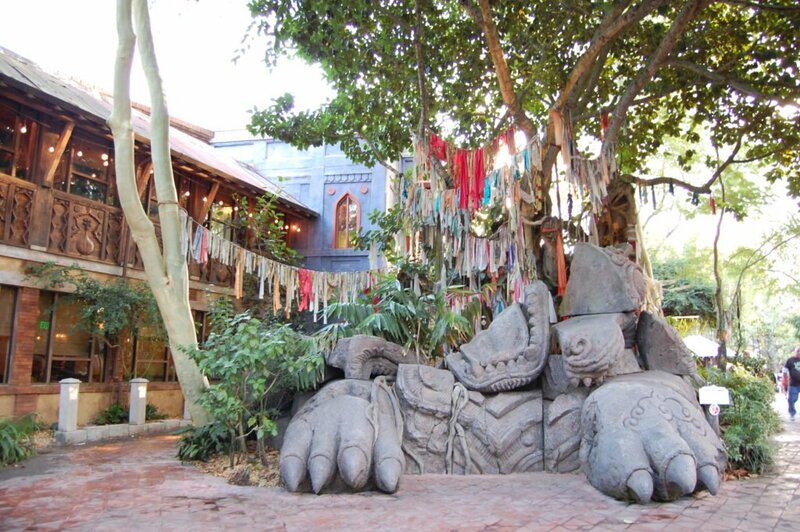 Harambe Marketplace and Theater District is another area of Animal Kingdom that is rich in details. This entire area looks like an authentic African village. All of this makes for amazing photo opportunities. Everywhere you look in Harambe, you will find the makings of some fun photos. 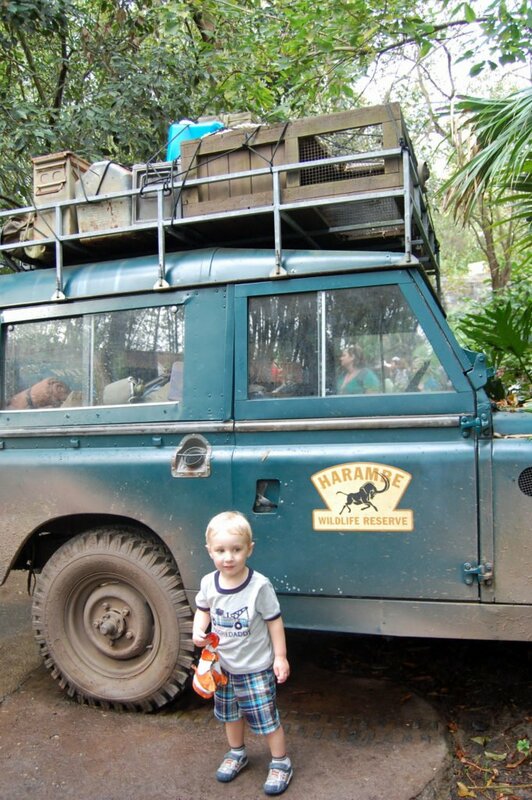 My son with the Harambe Wildlife Reserve truck. As you exit Kilimanjaro Safaris, look for a Harambe Wildlife Reserve truck. This is another place I like taking pictures. 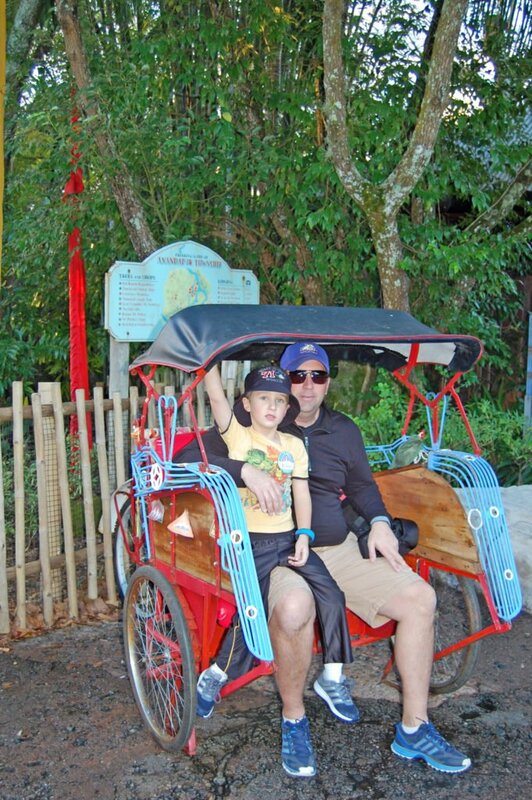 The truck serves as a wonderful way to remember your rides on Kilimanjaro Safari. Plus, it is a picture that so many people never take. I am a big fan of Rafiki’s Planet Watch. It takes some effort to get there because you must take the Wildlife Express train, but it is worth it. The entire area is a hidden gem that most people don’t bother with. There are much lower crowds here than in the rest of the park. Several areas at Rafiki’s Planet Watch make for great photos. Along the path to Conservation Station, you will see several cutouts of Rafiki. 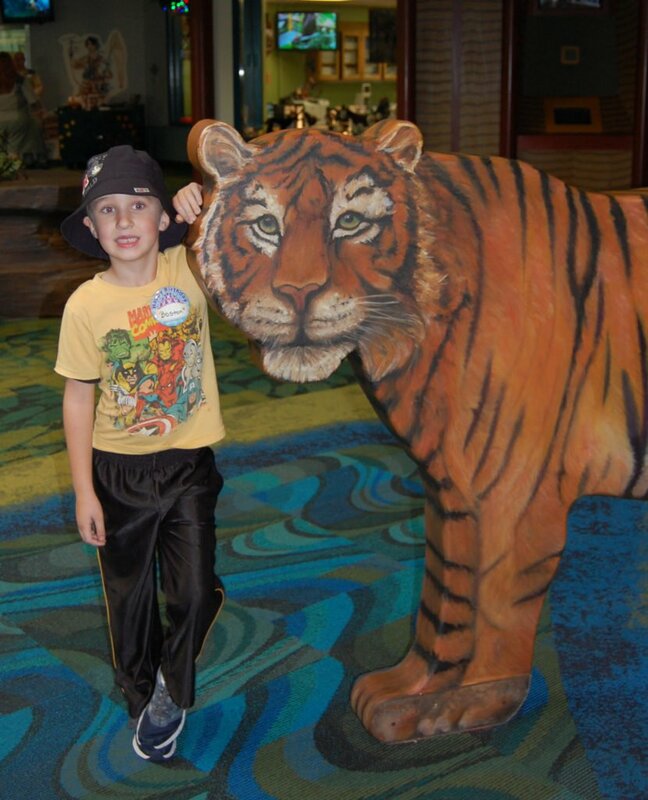 Inside the main building, there are some animal cutouts that make for cute photos of little ones. Another fun spot for photos is in the petting zoo with actual animals. 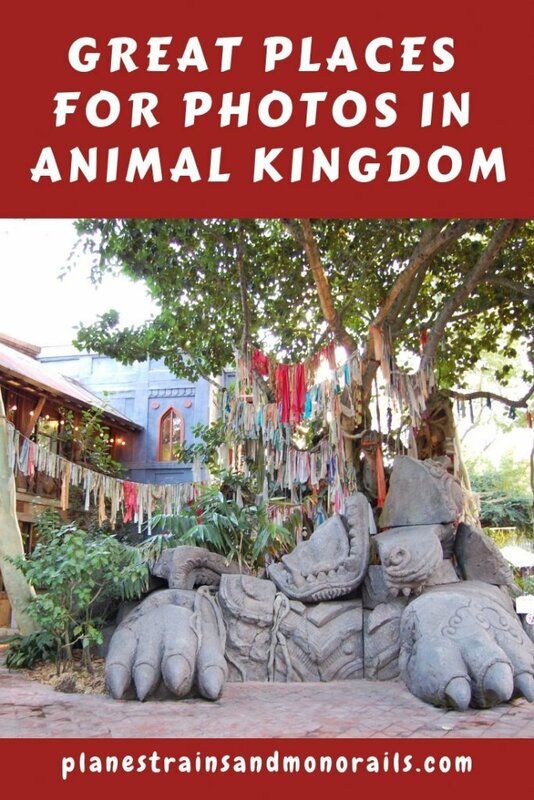 While this list is not exhaustive, it gives you some good ideas for great places for photos at Animal Kingdom. 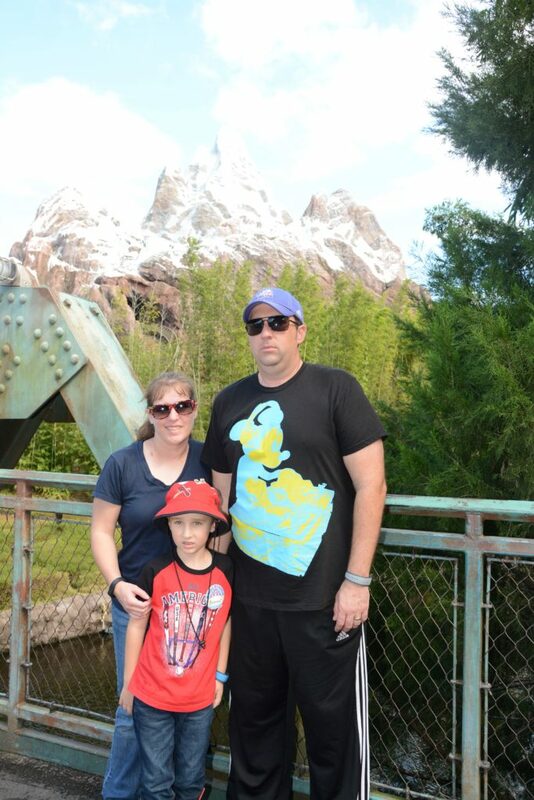 You should take those classic Disney World photos in front of the park icons, but for some variety in your vacation photos, seek out some of these less popular spots for family pictures. 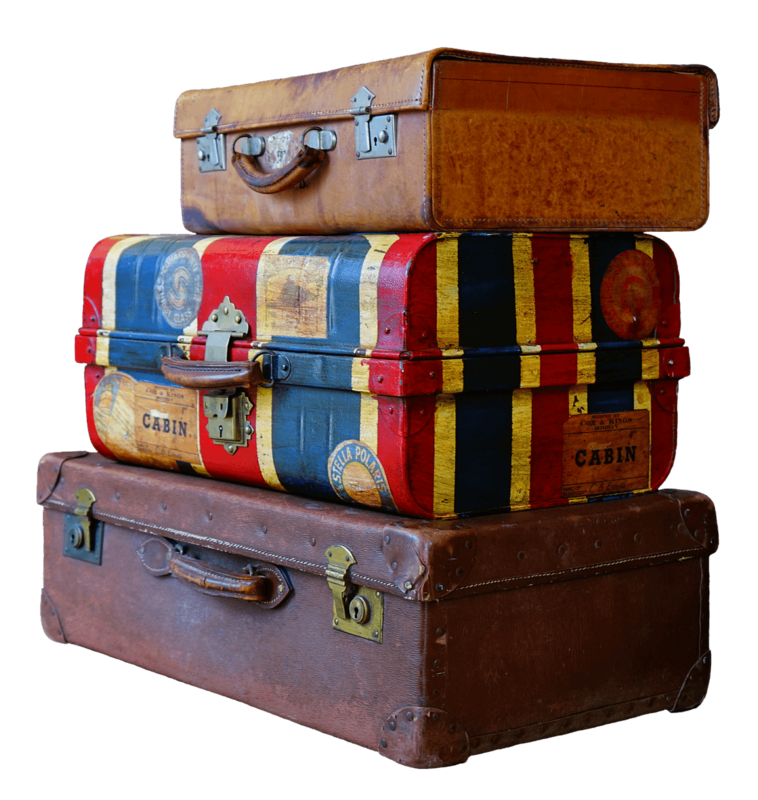 In addition to making your photos albums look more interesting, they will also help to spark all of those wonderful memories of your trip. For help planning your next Disney World trip, see my step-by-step guide, quick tips, and best resources. To book your trip, head over to Disney’s website. Happy travels!